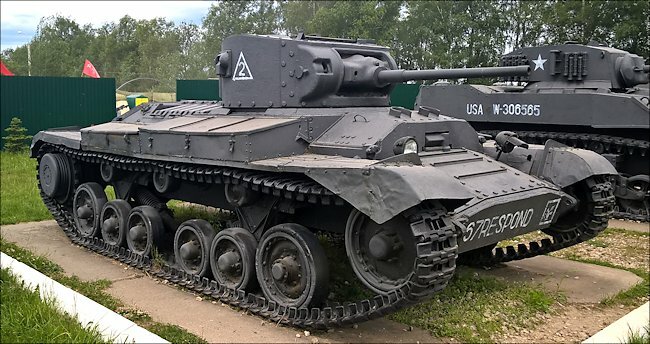 Thousands of British and American built tanks, like the Valentine tank, were shipped to Russian in a 'Lend-Lease' deal to provide additional tank fighting capability to the Soviet Red Army on the Eastern Front. Many were lost when the tank transport ships were torpedoed by U-Boats. 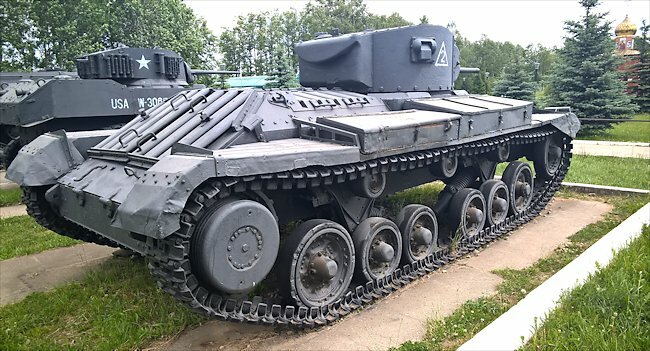 This British Infantry Tank MkIII, Valentine MkIV tank was powered by a AEC A190 diesel Engine. The Soviet Army preferred diesel engines. It had a top road speed of 15 mph (24 km/h) and an operational range of around 90 miles (140 km) before the crew needed to refuel. It was armed with a British Ordnance Quick Firing OQF 2-pounder (40mm) gun that could fire armour piercing AP anti-tank rounds with an effective range of 1,000 yards (914m). It could fire 22 rounds per minute with a good crew. It was also armed with a 7.92mm Besa Machine gun next to the main gun in the turret. It had a crew of three: commander, gunner and driver. The Mk III version had an additional member of crew, a loader. They were protected by armour that ranged in thickness from 8mm to 65mm. It has a Vickers-Armstrong Design build plate on it with a British War Department number T27543. It was built in 1941 and is shown on Red Army records on 12th December 1941. It served with the Soviet 171st Tank Battalion along with 9 other Valentine tanks sent in the same batch. 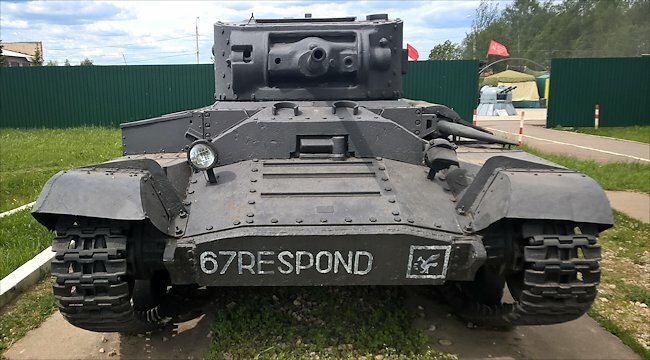 Valentine Infantry Tank was the most common type of tank shipped by Britain and Canada to the Soviet Union, totalling 1,388 Canadian and about 2,394 British vehicles. This accounted for nearly all Canadian production of this type, and about 29 per cent of British production. The Soviets received most of the variants of the basic tank including both the 2pdr and 6pdr armed versions, and a small number of bridge-layers. The Valentine proved the most popular British tank in Soviet service, preferred to the Matilda because of its better mobility. In fact, in 1943 when the British offered the Soviets the Cromwell in place of the older types, it was refused in favour of the Valentine. There had been plans to terminate Valentine production in 1943 on the grounds of obsolescence, but production was continued into 1944 solely to satisfy Soviet requirements. In 1942 the Soviets tried to rearm the Valentine with the T34/76 tank's 76.2mm gun, but this was unsuccessful because the turret was too small.